The ‘Smart Office’; where the evermore connected world spills into the corporate environment, with the aim of enhancing well-being and productivity.The idea of the Smart Office is for staff to embrace the modern workplace as an interconnected system with efficient operations. It’s about adopting new technologies and the IoT (Internet of Things) responding to individual needs, and allowing for increased user control over the environment they work in. Creating a tech-savvy office space that responds upon demand to the requirements of those who use it, can be the answer to an employer’s prayers in terms of wellbeing, productivity, staff retention and attracting the best talent. That’s why we’ve put together our top 5 favourite Smart Office gadgets that you could incorporate into your office design, fit out, or refurbishment that will connect everybody and improve the working environment. Offices are becoming more and more open plan than ever before. With collaborative working and brighter offices, it’s great for offering a more communal working environment. However, sometimes privacy is needed. Whether you have a meeting with an important client or simply need to knuckle down without distraction. This is where Smart Glass office partitioning comes in. Not only providing privacy, there are features such as temperature control, and the glass can even be used as a surface for projecting on to. Powell used Smart Glass partitioning in The Business Lounge, at the Welsh Government’s Merthyr Tydfil Hub. As part of a full design, fit out and furniture project, this contributed to a result of a modern, multi-functional and adjustable work space. 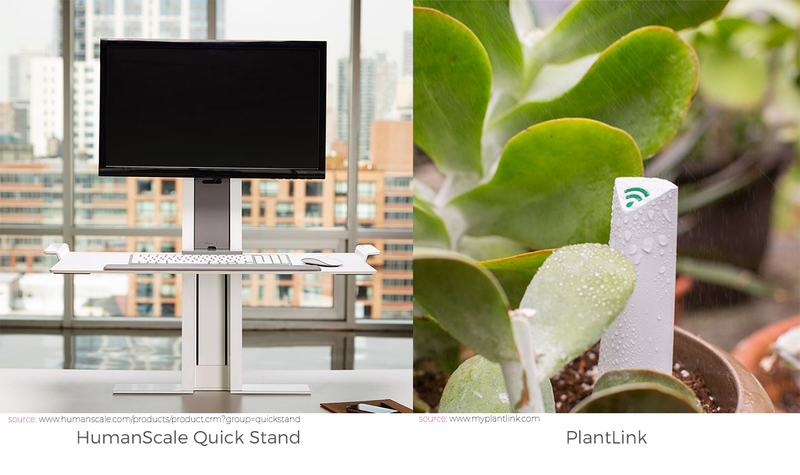 The Humanscale QuickStand is the ultimate sit-stand desk. With plug-and-play technology, this desk accessory can be quickly attached to the back of desks and adjusted quickly and easily to the position of the user. Spending more time standing at the desk has proven health benefits linked to blood sugar, weight, posture and even longevity. So, this modern type of desk can be just what you need to boost your employees’ health and well-being. This is a common phrase in many offices of today. With the likes of apps, communication and room-booking becoming more popular, everyone’s on their phones at work. Battery life on modern phones is lasting lesser amounts of time as mobiles are getting more powerful, so midday charging is quite frequent. 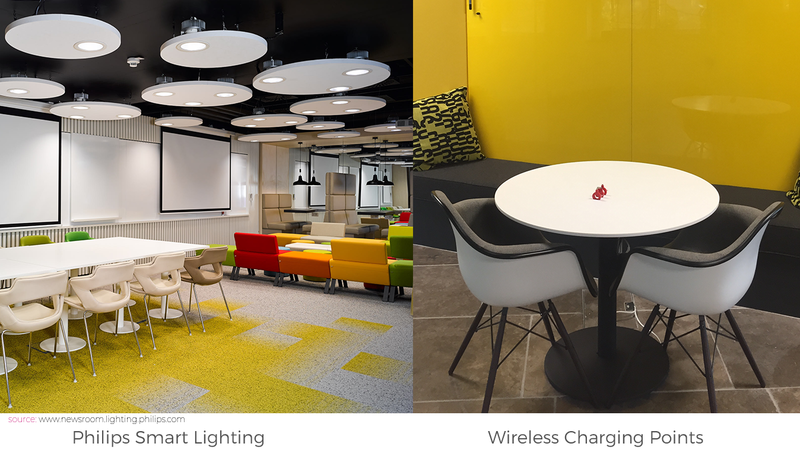 Supplying dedicated wireless charging points can take away the stress of employees’ battery life running out and productivity reducing. Philips Smart Lighting in the office truly is personalisation at it best. With the ability to adjust the lighting and the temperature depending on employee preferences and the task at hand, comfort and productivity are at the core of this product. These LED lights provide data insights, improve sustainability and enhance productivity. Gone are the days of fluorescent, buzzing lights causing migraines and costing productivity. We welcome customisable LED’s with open arms. With the rapid emergence of Biophilic Design, more and more offices are featuring plants and nature. Unfortunately, with plenty of plants comes plenty of upkeep. This is where PlantLink comes in. PlantLink can give reminders and set schedules for watering and feeding the plants in and around your office. Optional extras could mean outdoor plants are automatically watered when needed. Keeping up to date with tech in the office can really improve productivity and prevent the workplace becoming outdated with the way people work. Powell can incorporate Smart Office products into your office designs and fit outs. Give us a call at 029 20 23 23 23 if you’d like to know more about modernising your working environment with the latest tech. These were our favourite new ideas, tweet us yours @Powell_interior.